"Canine hives (canine urticaria) are an immediate allergic reaction to something that is either inhaled or comes in contact with your dog's skin. Symptoms include round red raised areas on the skin and itch. Dog hive treatment involves removal of the cause of the reaction, and the use of oral or topical medications to reduce itch and the severity of the reaction." 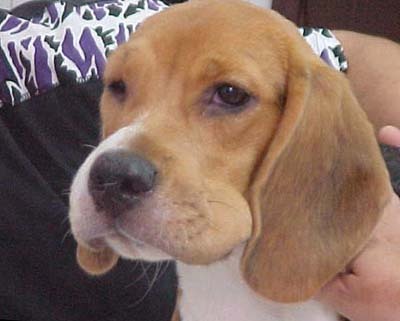 Canine hives are an immediate allergic reaction (within 30 minutes) to substances that a dog has a hypersensitivity to. These substances can be inhaled or absorbed through the skin. They can appear anywhere and usually disappear in 24 hours. Allergic reactions such as hives happen when an animal becomes sensitized to a particular allergen, triggering formation of antibodies (immumoglobulin E, or IgE) that attach to specialized connective tissue cells called mast cells and to blood cells called basophils. Hives are caused by insect bites, drug allergy (after vaccination common cause), insecticides (lawn treatments), new foods or soaps. You can recognize hives by the raised, circular appearance. You may see your dog’s hair raised in patches. Hives disappear once their cause is no longer in contact with your dog. Determine what has changed in the past several hours such as a new food or if you took your dog on a walk to a new area. For food allergies you can give your dog Milk of Magnesia (consult your Veterinarian first) that helps remove food from your dog's stomach. If hives are caused by soap or insecticide, give your dog a bath using products that have been been safely used prior to the hives appearing. Like humans, you can also give your dog Benadryl (2-4mg/kg or 2-4mg/2.2lbs of body weight orally every eight hours). For extreme cases your Veterinarian may also prescribe Cortisone treatments. If your dog is in an endless circle of itching and scratching, your veterinarian will probably also prescribe a topical medication (for example l% hydrocortisone) or an oral antihistamine (chlopheniramine or diphenhydramine) for itch relief. It is not unusual that different dog's have varied reactions to different drugs, so your Veterinarian may need to experiment to see what works the best. Short term Treatment with an oral corticosteroid (asprednisone) may also be prescribed. If the dog's scratching leads to secondary skin infection, your veterinarian may recommend oral or topical antibiotics as well. All dogs with hives or atopic skin conditions generally benefit from the soothing effects of a cool bath (warm or hot water makes may make the itching worse), with a colloidal oatmeal shampoo and/or conditioner. Bathing not only helps relieve the itch, but it also removes allergens from the skin through which they also can be absorbed. Natural remedies can act as a supportive approach to reduce skin itch and improve overall skin condition. For dog skin itch and allergies consider products such as Allergy Itch Ease. To improve dog skin condition use a tonic such as Skin and Coat Tonic. If the hives last four months or more, or when topical or oral medications have little effect or produce side effects, your veterinarian may suggest doing blood tests (RAST or ELISA) or intradermal skin tests (ID) to pinpoint specific allergens for allergy shot type treatments. Have A Question about Your Dog's Skin Condition? Our Vet Will Answer It for Free! Do you have a question or comment? Share it! Our editors will pick 1 question to answer each week. Please include your dog's age, breed, medical history, medications and if possible, a picture of the condition. Entering your question or comment is easy to do. Just type!...Please do not use all capital letters. Do you have a picture to add? Great! It will greatly help us provide advice that will help your dog. Click the button and find it on your computer. Then select it. Can Stress Cause Canine Hives? Giffin, James M. MD & Carlson, Liisa D., DVM “Dog Owner’s Home Veterinary Handbook”.